Long before Simon Cowell launched his reign of terror over TV networks the world over, in the 1980s our Cyclops here was already part of a very different X-Factor team in the Marvel Comics X-Men spin-off comic book series of the same name. One of the mutant X-Men since the very first issue in 1963, the Stan Lee / Jack Kirby creation is one of the most enduringly popular characters of the entire X-Men universe, so when Marvel relaunched the X-Men in 1991 Cyclops was swiftly incorporated back into the original team. Known as the “Uncanny X-Men” during the 1980s, the relaunch saw Marvel drop the “Uncanny” tag on the comics, but with toy manufacturer Toy Biz continuing to use the full “Uncanny X-Men” title on their action figure packaging cards, confusion abounds! 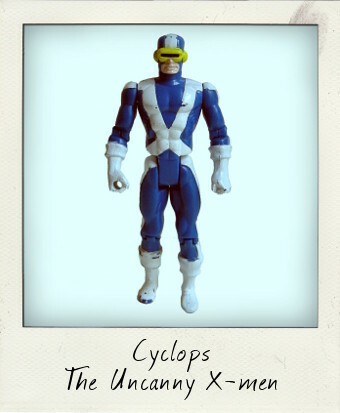 And to muddle things even further, this Cyclops figure sees him wearing his distinctive X-Factor uniform with its large white “X”, rather than his traditional X-Men costume. Issued as part of the very first wave of nine figures, Cyclops was accompanied by Storm, Archangel, Nightcrawler, Colossus, Juggernaut, Magneto, Apocalypse, and of course, Wolverine. a red LED light illuminates his visor when a switch on his back is tripped. I bought my loose Cyclops together with several other X-Men figures, and by the look of his paint work, he was definitely the most beloved of the set and has seen some heavy play. In spite of this, however, the very second I removed him from his bubble wrap and tested his laser visor, I was amazed to see it flicker into life for a few seconds! Alas, I witnessed the very last burst of life from the built-in batteries – I've never managed to coax as much as a glimmer of life out of them since! 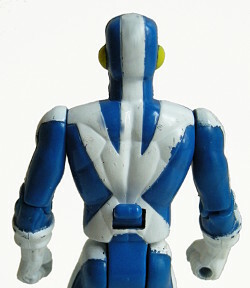 The only real gripe with this figure is the fact that the batteries could not be changed. As seems to have been the case with several of the Toy Biz X-Men his right fist is molded ready as if to hold some kind of weapon, even thought there weren't actually any hand-held weapons issued for this figure. Instead, he was packaged with a “Portable Cerebro Unit” accessory which would clip onto both arms. 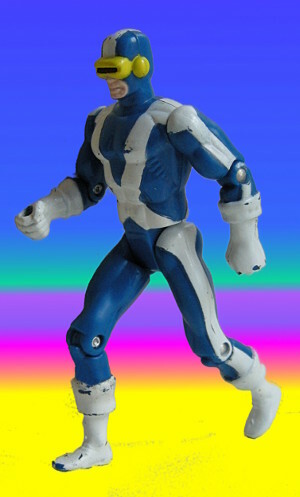 A must-have vintage action figure to add to any X-Men or Marvel Comics collection! Collect them all – you KNOW you want to!